When my then-partner and now-wife and I were preparing to go to Iceland in 2016, I did a TON of research online, looking for delicious restaurants with local cuisine; romantic scenic views; and engaging venues and attractions. This involved a lot of emailing, printing of ideas and locations, marking locations of places we wanted to go on paper maps, etc. We’ve all read articles about a great restaurant, bookstore, shop, gallery or destination, that and decided we’d love to visit. We saved it, wrote it down, or committed it to memory. But how often can you actually find it again or remember the details, when you want it? Thankfully, between 2016 and 2018 a lot has changed – including the introduction of MapPost, a new travel app and extension that allows users to save location-based content on their own personal map as they browse the web, so that they always gave those articles and locations at their fingertips, where and when they need them. MapPost is a mobile and browser-based app for saving and keeping track of all your favorite destinations and venues. Your very own map is kept up-to-date across all your devices and is readily available whenever and wherever you need it. 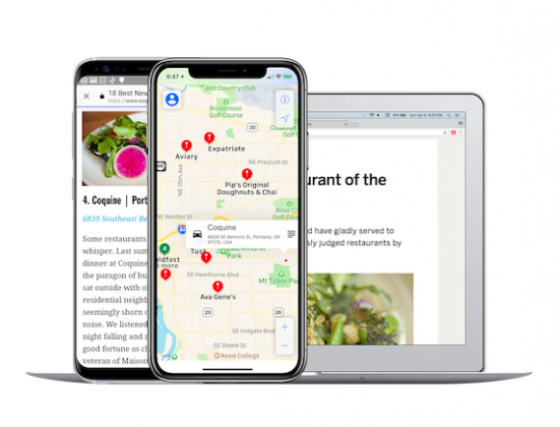 The app or extension saves all those destinations you come across while browsing the web, by pinning the articles containing location-based content to a personal map for you, at the locations described in the articles. You can save articles from both iOS and Android browsers and apps, Safari, Firefox and Chrome mobile browsers as well as a wide variety of popular apps, including Twitter, Pinterest, Medium, Evernote, Pocket, Quora, Apple News, Business Insider, New York Times, TripAdvisor, Yelp, and others. If your favorite app’s ‘Share’ button shows MapPost, you should be able to save to MapPost. On your map, you’ll see red pins that are yours (and invisible to others), blue pins that indicate popular places, venues, and locations that have been saved by multiple users, and green pins that have numbers inside them, which represent clusters of pins that are too close together to be resolved at the scale you’re viewing them. Save Places That Matter: When you come across articles discussing locations you want to save for later, MapPost makes your life easier by allowing you to save them to MapPost from your browser as well as many of your favorite apps. Creating Your Map Is Easy: It takes just seconds and a few clicks to create your own map with all your favorite places, which is then accessible from any laptop, desktop, or device you have MapPost on. Where And Why Remembered For You: Use your map when you’re planning a trip, organizing a spur-of-the-moment outing, or working on your to-do list. Your locations and articles will be there for you, where and when you want them. MapPost is currently available as both an iOS and Android app, as well as a browser extension for Chrome, Firefox, and Safari.